Frustrated about body corporate overheads and electricity prices? Solar energy is far from a secret, but for strata property residents it’s been an option at arms length for many years. But all that could be about to change with Governments making moves to unlock strata communities from the solar market. The experts are saying the strata solar boom is just around the corner, so let’s look at what’s changed. Decisions already made or promised by the New South Wales, Victorian and Western Australian State Governments have opened the door for strata schemes to go green. The newly elected Premier Gladys Berejiklian has promised the NSW Coalition will make the switch for apartment going solar easier, by easing strata laws. The planned laws will reduce the owner committee voting threshold from 75% to 50%, making it drastically easier for owners corporations and apartment owners to install green solar energy initiatives. The NSW Coalition has also pledged to provide 300,000 homes with a combined income of up to $180,000 no interest loans over 10 years of up to $9,000 for a solar system and up to $14,000 for a solar-battery system. The Victorian government has also joined the sustainability movement, introducing plans last year to install subsidized solar power systems in 650,000 homes over the next 10 years. The Solar Home program $1.24 billion scheme took effect in August 2018, where strata households with a combined income of up to $180,000 and property valuation of up to $3 million were eligible to go green. Eligible strata apartments and home are currently able to install solar panel systems and receive half the costs back with a 50% government rebate. Later, this year in July the scheme will be expanded if Labour is reelected in the state election, where eligible houses will pay half the initial costs up-front, with the remainder paid over four years with an interest-free loan. In Western Australia, apartment owners looking to make the switch to renewable energy currently take advantage of the national Small-scale Renewable Energy Scheme which is due to expire in 2030. The current arrangements awards strata owners Small-scale Technology certificates, which are used to subsidize the upfront costs of roof-top solar panels with retailers. The state also has in place a Renewable Energy Buyback Scheme, where state-owned power generator and retailer Synergy is required to pay households with solar panels 7.1 c/kWh for excess power exported to the grid. Solar for strata communities can come in two main forms: a single solar system to power the common area or multiple smaller systems powering individual apartments. The choice is usually dictated by the buildings size and energy usage demands. 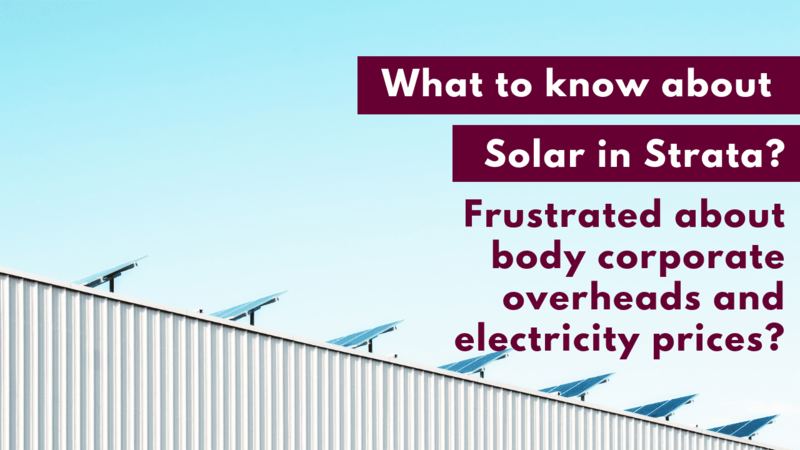 For smaller strata buildings typically 3 stories high, with ample sunny roof space per unit, it’s recommended installing solar systems for individual units to power energy consumption. Installing batteries, to the solar system can also allow for greater reliance on renewable energy but creates further challenges for fire-prevention planning. However, if the building is higher than this, with a ratio of less sunshine to apartment, a single solar system to power common areas is recommended. If you’re thinking about installing solar in your strata apartment building, it’s important you first seek the advice of owner’s corporation committees and landlords before you make the switch to go green.